That certainly looks like a trend to me. Generally speaking, the average defenseman contributed 16.2% of all on-ice shot attempts this year; keep in mind, in a 5v5 situation with an even distribution of OSP among all players, you’d be at 20%. I wanted to dig deeper, though, and see if there was any differences between top players and the bottom. The uniformity in that trend is remarkable. 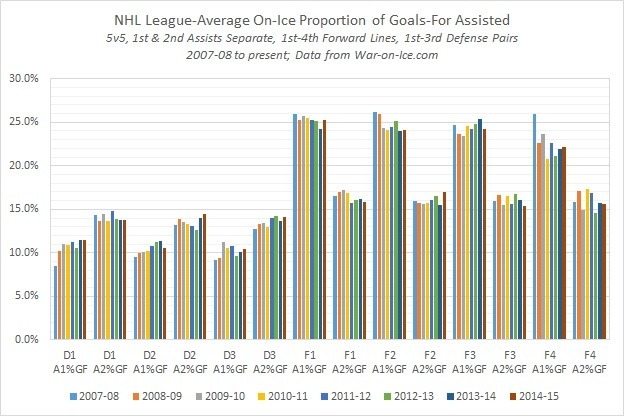 Teams are either a) having their defensemen shoot more often, or b) choosing defensemen who tend to shoot more often. Either way, it’s generating a greater share of attempts from the point, and it’s coming from the top on down. While the defensive third pair is a bit up-and-down, the first and second are clearly on the move, in the opposite direction of the first and second forward lines. The third forward line is mixed, but the fourth forward line is pretty astonishing. Remember the third graph from my post on parity? 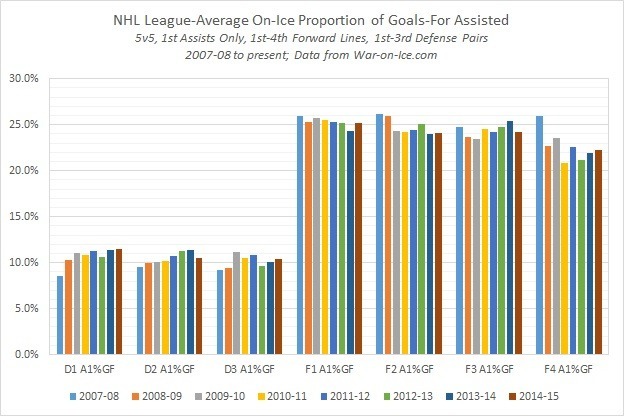 In it, the zone starts for the top 3 forward lines seemed to only have slight trends, but the fourth showed a pretty drastic drop in zone starts over the years, suggesting teams have moved towards a sort of defense specialization for them. That’s certainly supported by their drop-off here. Chalk this up to another potential impact of the pressure of parity, and the demand for control of the puck. Teams are gradually realizing that they need more-complete defensemen — ones that can move the puck, not merely stop it — and whether by strategy or selection, they’re getting it. ← Will the 2015-16 Calgary Flames follow the 2014-2015 Colorado Avalanche? This would explain why league average shooting percentage is dropping slightly. I wonder if this might be because teams are collapsing a bit more and are better at defending the blue. 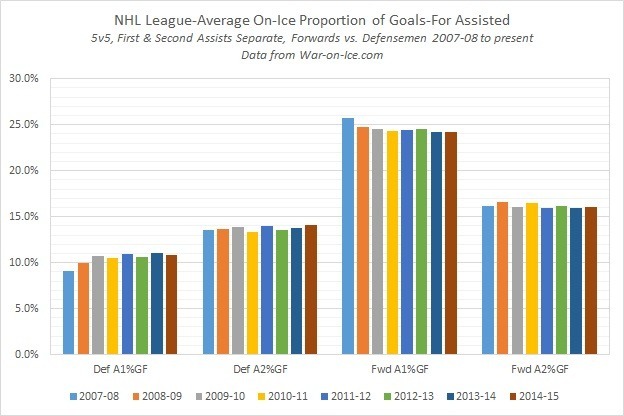 I wonder if individual dmen are shooting more often, or if there are new guys getting more shots. I would guess the latter. 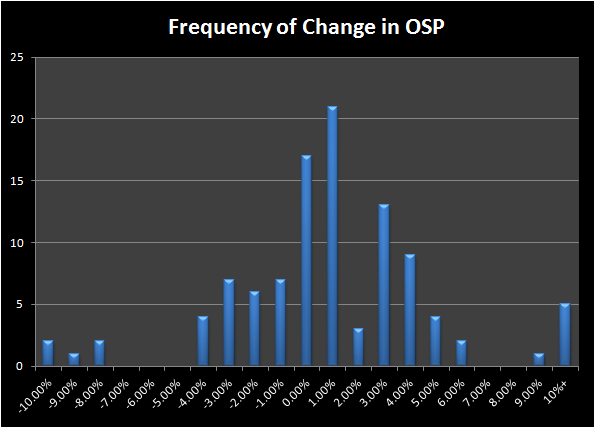 I have an upcoming post where I demonstrate that, by this OSP metric, players tend to retain their share of the shooting individually. Yea, and after looking into it more, you are definitely right. Interesting. Looking forwardto that post. So, in keeper fantasy hockey pools, if the trend continues, defencemen may be of slightly increased value, and forwards of slightly decreased value? If it continues like this, and I’m confident it will…yes. But moreso because it’ll close up a fantasy market inefficiency. For the last few years, there was a pretty substantial gap between reliable top scoring defensemen like Karlsson, Subban, and Weber, and the highly-volatile next tier of defensemen. That group was a near guarantee for 50-points, while the next tier varied so wildly your expectation was 15 points less – but the big difference was that top group was larger than the similar top forward group that would score 15 points more than the second tier. In those years, if you were picking past 6 or 7, you’d do just as well to go D, F, or even D, D if you had strong forward sleepers in mind. This year, for instance, I had a low 1st round pick in a league and went Karlsson and Weber (Subban was picked in-between), then made later-round picks of Hornquist, Vrbata, and Tarasenko. Nothing lost in my forward group, and a reliable 15 point boost. 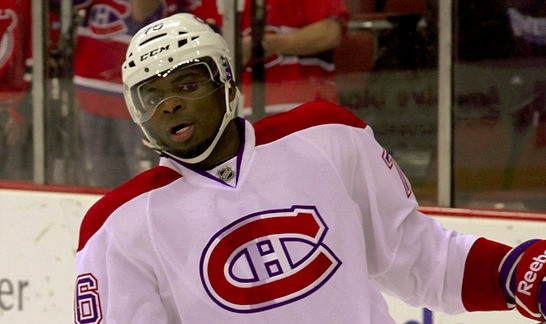 With more offensive-inclined defensemen, this could close the gap between the defense tiers. I should say, 30-point predictive boost, since I netted both Karlsson and Weber – which ended up around 25-point because Weber performed below expectation. Still kept me in the top of the league for the whole season. Ok, but what’s the upshot of this? Definitely an interesting trend, but what on-ice effect does it have? Scoring is trending downward league-wide, but it would be interesting to break this data down on a team-by-team basis to see if some teams are driving this defense-heavy shot approach more than others, and whether those teams are generating more goals or improving their overall goal differentials. There would be some noise to filter out in team-by-team statistics, since personnel changes can herald a change in offensive approach, but I think it would help us understand the effects of what we’re seeing above. 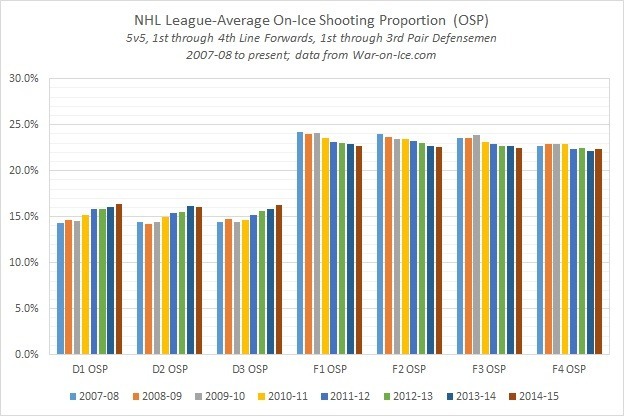 Other questions: We know that shooting percentages are lower for defensemen; is this trend dragging down shooting percentages overall? 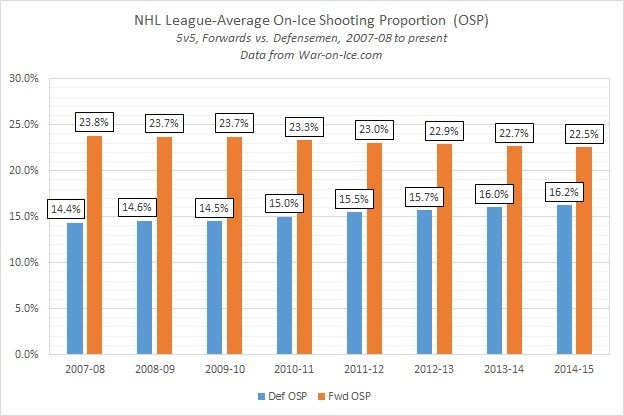 Are defensive shooting percentages climbing because defensemen are more involved in the offense, and are taking more shots from higher-percentage areas on the ice? Are the defensemen stealing shots from the forwards, or are teams that give defensemen the green light to fire away simply generating more shots?